A&T’s Chris Belcher wins track athlete of the year for his region, which includes ACC and SEC schools. GREENSBORO (June 5, 2017) – North Carolina A&T sprinter Christopher Belcher (5-foot-11 SR, Sayville, NY) earned another accolade ahead of the 2017 NCAA Division I Track and Field Championships where he has a chance to earn two individual national titles and a 4×100-meter relay national title. Belcher was named the United States Track and Field and Cross Country Coaches Association Southeast Region Track Athlete of the Year. Belcher is the first Aggie athlete to earn such an honor from the USTFCCCA. Teams in the Southeast region include Clemson, Kentucky, South Carolina and Virginia Tech. Belcher and 12 of his teammates are in Eugene, Ore., for the NCAA nationals, June 7-10. Belcher’s superb season will culminate with him competing for a national title in the 100 and 200 meters along with the 4×1. Before he even runs this week, Belcher’s season has already been historic. 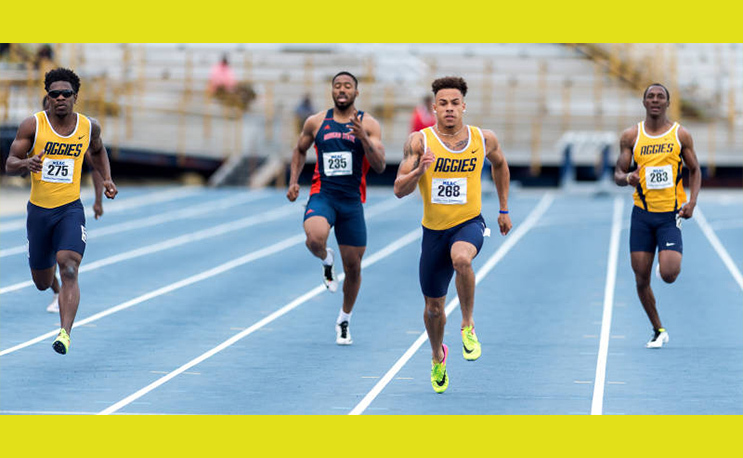 In April at the 2017 Aggie Invitational at N.C. A&T’s Irwin Belk Track, Belcher ran a blazing 9.99 with help from the wind. At the time, it was the fastest time in the nation, the second-fastest wind-aided time in the world and the fourth-fastest time overall. Belcher’s 9.99 still ranks him fifth in the nation in the 100. But 9.99 was only the beginning. Belcher went on to run a 10.05 without it being wind-aided at the University of Florida’s Tom Jones Memorial on April 28. Then came the 2017 Mid-Eastern Athletic Conference Outdoor Track and Field Championships where Belcher led the Aggie men to their first MEAC title in 21 years. Belcher won his second straight 100m conference title by running a 10.04 (w). He also ran a 20.59 in the 200m to win his second straight conference title in the event. Belcher and his 4×1 teammates also won the MEAC with a school-record 39.44. In search of a better time, a week later the 4×1 foursome ran a 39.25 at the Aggie Last Chance meet. At the 2017 NCAA Division I East Preliminary Round in Lexington, Ky., Belcher was again outstanding. He qualified for this week’s 100m semifinals by running a 10.13 for the second-fastest qualifying time. He also ran a 20.06 at the East Prelims for a new school record and the fastest first-round qualifying time in Lexington, Ky. The 4×1 team again lowered the school and conference records by running a 38.76 for the fourth-fastest qualifying time.